"Full bodied, smooth and velvety, but approachable and versatile in its food pairings. Combines simplicity with style, strength and majesty." Shows attractive, tropical fruit aromas. Fresh and charming palate flavors gain weight and become full on the midpalate, where fruitiness blends with traces of honey. A dry finish has a citrus twist. Wine Enthusiast 92 "Aromas of crushed violet, baked plum, cake spice, ripe berry and tobacco pervade in this bold, full-bodied red. The firm palate offers ripe black cherry, fig, mocha, nutmeg, licorice and tobacco alongside velvety tannins." "Although it carries an IGT designation, Campofiorin is one of the first commercially successful examples of Ripasso (a second fermentation occurs on the skins of Amarone) produced in Valpolicella. 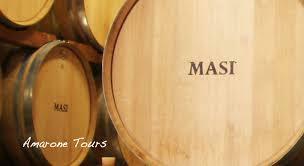 The folks at Masi take enormous credit for perfecting this innovative technique over the years.